Picture this: You’re drifting through a grass flat in the marsh somewhere in St. Bernard parish. 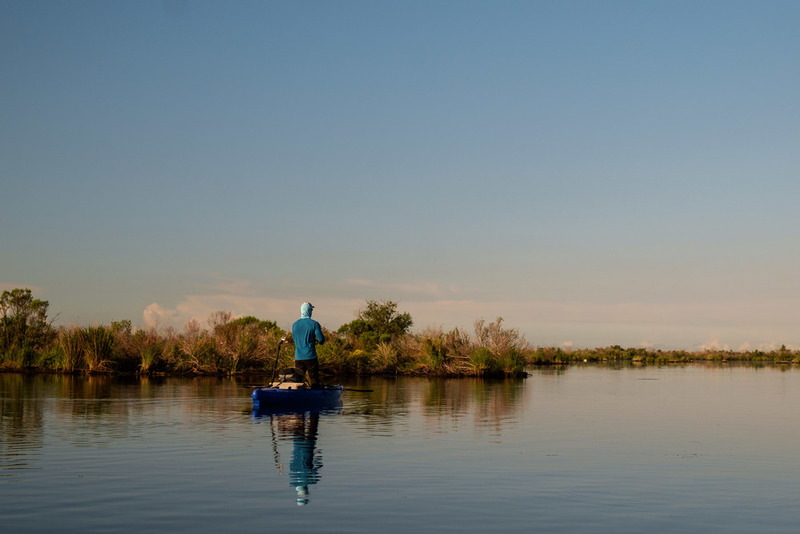 Standing comfortably in your kayak, paddle in hand, continually scanning the water around you in search of redfish. As your vision sweeps to the left, you suddenly forget to breath, and a strange weakness affects your knees. 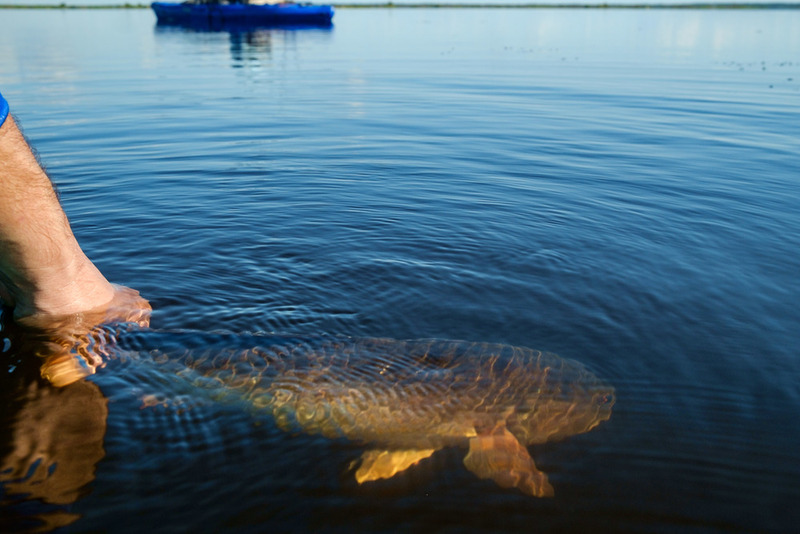 A pod of 6-8 redfish is swimming directly towards the nose of your kayak, looking lean, mean and hungry. There’s only seconds to do this right, so you quickly clip your paddle to your waist with your left hand and pick up the rod in front of you with your right hand, keeping your eyes tracking the fish. A one short cast that leads the pod of fish by several feet and a slight pop of the rod tip is all it takes - redfish moving in packs are more concerned about making sure they’re the first one to eat whatever it is that’s moving than they are concerned about making sure it’s actually food. Fish on! The fish erupts in fury, and his buddies scatter in every direction. Now hooked to an angry 28 inch golden St. Bernard pumpkin, the last part of your task is to keep tension on the line while simultaneously sitting down successfully in a moving kayak, then to land the fish before it is totally exhausted. Landed, de-hooked and rested, the fish gives one good strong push and is back under its own power. Wiping your hands and taking a sip of water, you look around and see not a living soul, but hear the wind in the grass and the red-winged blackbirds chirping. The way it should be, you think, and you wonder what in the world you did with your free time before you knew about sight fishing redfish out of a kayak. Of course, it’s not always like that. You’ll have as many misses or more, as you do successful hookups. You’ll have days where the wind and sun just won’t cooperate, and you’ll probably get overconfident at some point and fall out of the kayak. But I can say with almost absolute certainty, that once you have some success sight fishing reds from a kayak, you’ll keep coming back for more. There’s something about being in your own small watercraft; just you, the marsh and the fish, that is ultimately very rewarding. This article aims to get you started with some information that may help you accelerate the learning curve a little bit, based on my experience picking the process up. The stalk. Nothing compares to watching a fish that has no idea that you’re there react to and strike the lure you just placed in the perfect place. Once in Leeville, I watched a fishing buddy follow a single fish through at least 3-4 ponds and multiple canals before he finally was able to hook what turned out to be a 30”+ inch fish in about 12” of water. The amount you learn about what it is that’s happening in the water - my knowledge about what fish are making what wakes, fish reactions to lures and bait has expanded greatly since I started standing a lot and sight fishing. Knowing for sure whether or not there are fish in the water you’re paddling. I am not a patient angler. I can’t stand just blind casting and hoping there are fish around. Even if I don’t have any luck sight casting, I’m way happier blind casting if I was able to see a few good redfish and know that I’m in a good spot to be fishing. Of course, this can be a handicap as well, because I often waste time in horrible conditions for sight fishing, straining to see fish while other people bring them in on popping corks and laugh at me. Even if you miss a fish, and you will miss a lot, you have a great experience. You saw a fish, you held your breath while you made a cast, you watched the fish swim right up to it and laugh at it, and you cursed the gods as it swam away, and you learned something about your presentation or the lure choice. That’s still more exciting and enlightening than popping that cork for the umpteenth time, in my book. Just trust me. If you don't trust me, watch the video below and see if that doesn't get you ready to give it a shot. Josh Reppel keeping his eyes out for any sign of redfish. It’s rewarding. You paddled or pedaled yourself out there. You did what you could, found good water and fish, and you brought dinner home, or at the very least you did your best and spent the day outdoors and didn't spend a dime on gas or upkeep on a boat. It’s good exercise. Since I started kayak fishing, I have lost at least 20lbs. Some of that is due to a more balanced diet (fish heavy) and exercise outside of kayaking, but being out there paddling and sweating definitely contributed to the loss. I also found a new interest in being in shape, in order to be able to paddle and fish more and more. You can put in almost anywhere, you’re not restricted to official boat launches. Of course, you need to exercise good judgement and respect for private property, but there are good options beyond the marinas that boats utilize. It’s cheaper than a boat. By a lot. Also, it runs on coffee and donuts. Kayaks require very little initial investment, and can be carried on any vehicle. It could be argued that it forces you to fish smarter and harder, since you can’t pick up and run out to a million locations. You have to learn the areas and really figure out how to make it happen. Poling through a large flat on a calm day is like nothing else. Relatively stable kayak, with a flat surface to stand on. DOES NOT need to be extremely wide, needs to have good secondary stability, and you need to spend time getting used to it. PFD. Even though the marsh is usually shallow, there is a chance you could have a medical emergency, or hit your head. There are good, comfortable options out there and no reason not to use it. Also provides lots of good storage for leader, clippers, pliers etc. Polarized sunglasses. Amber works for me. I also like to use a hooded shirt, which cuts down on the reflections from sun hitting the back of the lenses. Wide brim hats are also good for shade, although I have never gotten used to wearing one. Staging area for one pole within easy reach while standing. In my Kilroy, I'm able to simply set the pole down in front of me, leaning on the front hatch. It's a great and simple setup, and keeps me from having to use a pole holder on the front of the boat, eliminating one more item that is prone to interfering with line. Method for securing your paddle. Some like to jam it in the ground and use it as an anchor, others set it down carefully on the boat. I like to clip it into a belt clip, because I feel it is much faster, and I don’t want to be anchored most of the time. Physical fitness. There is a lot going on when you are standing up in a kayak, paddling around and casting/landing fish. The better shape you are in, the more your body is going to follow through with what you’re trying to achieve. You don’t need to be Adonis, but the more balance and strength you have, the more you can concentrate on fishing. Waterproof storage for your phone and personal items. Trust me. You’re going to fall in at least once. Willingness to know you’re going to fall in at some point, and that it isn’t a big deal. Grass mats often means there is clean water in the vicinity. Get comfortable with standing and paddling first. Practice a bit on a friendly body of water, without all your gear in. Learn where your kayak’s secondary stability and tipping point is. The easiest way to fall in is to let your body overreact to a small bit of instability in the kayak. Most of the kayaks are extremely stable, and will lean way further than you think they will before tipping. You want to let your body get comfortable with that, so you can concentrate on sighting and casting to fish. Get a good routine set up, with one pole stashed somewhere that you can reach it while standing up, and without taking your eyes off the fish. The more that you settle into one routine, the quicker and smoother you can make it. Find some clean water. In most cases, clean water means there is grass nearby. You don’t need aquarium clean water, but you want to be able to see any fish that isn’t sitting right on the bottom. Pay close attention to your positioning, as it is absolutely crucial for sight fishing. Carefully consider the sun angle and wind/water direction. You want the sun at your back for maximum viewing potential, and you want the wind moving you in the direction you want to be traveling. If that means you need to paddle upwind first, then drift back down a bank, have the patience to do that rather than fighting into the wind and scaring most of the fish in the process. Lead the fish more than you think you need to. At first you will probably scare off a lot of fish by casting right at them. Put it a ways away and bring it in. They do not at all like lures suddenly appearing right next to them out of thin air. I have found that my success rate is much, much higher if they see it coming and think they are sneaking up on it, than if it just lands close to them. Cast lightly, and work your presentation gently. One of the best things about sight fishing is that you get immediate feedback from the fish. If you’re anything like me, you are going to realize that you were probably fishing too fast while blind casting. The lure moves faster than you think while reeling, and as you observe bait fish and crabs in the water, you see that they really don’t move that quickly unless they’re spooked. A small pop of the rod tip often helps provide enough movement to catch a fish’s vision. Work with their behavior. If they are tailing, that means they are eating off the bottom, and most likely eating crabs. Use a gold spoon and put it down on the bottom. If they’re swimming up higher in the water column, they are probably expecting to see bait fish, and a different lure is probably a better option. Pre-visualization - knowing how you will react to a fish, and reading the terrain you are seeing. As you gain experience, you start to recognize likely places that fish will be, and likely ways they might be traveling. Sometimes as I move into an area that I believe will have fish, I will hold the rod and the paddle at the same time. I’ve caught redfish literally feet from the boat that would probably have spooked if I would have needed to pick up the rod. Sometimes you will freeze up and make a bad decision, and I have found that talking myself through what I am going to do can help the mind focus and be prepared, just like many athletes prepare themselves for matches or games. Move deliberately when preparing to cast. You will often only have seconds to make a cast, but jerky movements and any sound can easily spook fish. The clearer the water, the more easily they will see you, and the more care you have to take when moving. Don’t yell and cuss when you miss one. Sometimes they just don’t know what happened, why that little meal just up and jumped out of their mouth, and they hang around to see if it comes back. Sometimes they seem to want it more the second time you present it. I almost screwed up on a 41.5” redfish this year - he spit the lure out on the first cast, and I thought it was all over and almost yelled, but noticed he hadn’t taken off. Another cast, and I got my personal best sight casted redfish. I have found that baitcasting reels are faster to cast, and can be operated with one hand if you don’t have time to set down the paddle. I missed a lot of fish while messing with the bail on my spinning reel. Always reel your lure all the way to the tip of the rod. If you don’t, it is a virtual guarantee that you will have a tangle or wrapped line when you want to cast. Don’t set the hook right when you see them eat. You will do this. It will frustrate you until you learn to temper your excitement and give it a minute before you set the hook. Sometimes redfish literally will not eat. If they refuse a lure multiple times or are just sitting on the bottom, just move on and find others that are swimming higher in the water column or tailing with their noses in the mud. Those are actively feeding and are more likely to feed. Don’t bother to chase fish if you spook them. Nine times out of ten, you will waste your time and they won’t eat. Unless you’ve been seeing very few fish, it is probably a waste of your time. If you see a pod of fish, and you have time, put your paddle or anchor down and try to pull one out of the pod. If you don’t anchor, the fish will probably pull you right into the others and send them scattering. From time to time as you’re poling, check your rod and any other rope/line you have in the kayak. I use a paddle leash that has a lovely habit of wrapping around the handles of my baitcaster and creating a bad scenario when I’m ready to cast. Good sign for sight fishing - calm water! Poling along a shore is a great place to see redfish, particularly in the early morning hours before it is too hot. Letting a nice one go. Dead giveaway of a redfish - look at the broad wake being pushed from bottom right to top left of the frame. Good looking water and grass. When the fish aren't spooky, or the water is a little less than perfectly clear, a weedless inline-spinner can be a great option. This is a Red-Alert Lures spinner.